I have a story tonight at CIDRAP about a paper published this evening in the journal Science. To respect fair use and make sure my colleagues get clicks, I just quote the story here — but then I want to talk about why I think it's such an important study. If you'd like more, here's a very good story at Scientific American, one at BBC Health and one by the Associated Press; and Science Daily's version. Now, the details. This team (which has 15 members from almost as many institutions) secured two collections of MRSA isolates: 43 collected from all over the globe between 1982 and 2003, and 20 from a single hospital in Thailand, collected between October 2006 and November 2007. All of the isolates were ST239, which is a hospital-acquired strain that is particularly prevalent in Asia. They analyzed them using high-throughput sequencing, with a particular analyzer (Illumina) that could produce whole genomes of up to 96 isolates very quickly (an extraordinary advance from the weeks and months it used to take to achieve a single whole genome). Then they compared the genomes, looking for single-letter changes in the genetic code (single-nucleotide polymorphisms, SNPs or "snips," and also insertions and deletions of nucleotides). 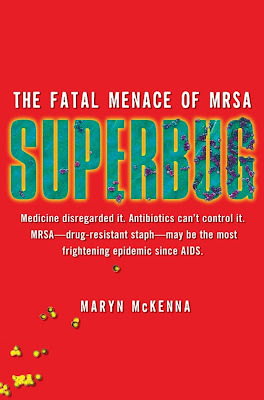 They used those findings to construct a "family tree" of 239 that tracks very nicely with the known history of MRSA's emergence and initial spread, and that pinpoints rare but intriguing importations of clones from certain areas into other parts of the world. But it's what they found in the Thai hospital isolates that is especially interesting. (Most of this is not explicit in the paper, but was related in the press briefing that Science conducted on Wednesday). The differences that can be seen in the whole-genome analysis can't be discerned by earlier identification methods, so the isolates collected at the hospital appeared to be the same. However, they weren't the same. Some of them were very closely related, and formed what seems to have been a chain of person-to-person transmission — a true hospital-acquired outbreak. But others of them were not so closely related, either to the outbreak or to each other. What they were, instead, were individual importations into the hospital of a hospital strain that had been acquired outside the hospital, and were carried in by staff, patients, visitors. ..."That implies you have to have a different perspective on where you are going to apply your infection-control procedures and strategies," co-author Dr. Sharon Peacock of the University of Cambridge said during the briefing. But search and destroy remains remarkably controversial here in the US, despite strong proof of concept demonstrations in healthcare institutions such as Evanston-Northwestern Healthcare, and adoption throughout the VA system. I'll be interested to see whether this paper makes a dent in the overall resistance to search and destroy, and if not, to hear why not. Drawing your attention: I have a story up tonight at CIDRAP on a new paper by Dr. Jan Kluytmans, a Dutch physician and microbiologist and one of the lead researchers tracking "pig MRSA," ST398. (All past stories on ST398 here.) It's a review paper, which is to say that it summarizes key existing findings rather than presenting original research. Still, it's important reading because Kluytmans is one of the few scientists who have some history with this bug and understand how quickly and unpredictably it has spread across borders and oceans, from pigs to other livestock, to pig farmers and veterinarians, into health care workers and hospital patients who have no known livestock contact, and now into retail meat in Europe, Canada and the United States. Take-away: A plea and warning for better surveillance, so that we can track not only the bug's vast range, but also its evolution as it moves into new ecological niches — including humans who are buying that retail meat and possibly becoming colonized with it as they prep it for cooking in their home kitchens. Because the novel strain has spread so widely and has already been identified as a cause of hospital outbreaks, it should not be allowed to spread further without surveillance, Kluytmans argues. "It is unlikely that this reservoir will be eradicated easily," he writes. "Considering the potential implications of the reservoir in food production animals and the widespread presence in meat, the epidemiology of [MRSA] ST398 in humans needs to be monitored carefully." SUPERBUG website coming - what would you like to see? Constant readers, with publication of SUPERBUG the book coming closer, I'm starting to put together the pieces for a website. It will have stuff about the book, of course: details, excerpts, behind-the-scenes goodies, news on the key characters, and more. But my hope would be for the site to go beyond that, and to be a resource for people who want information about MRSA, or who want to network with other patient and family members, or find like-minded activists to talk with about the dangers of antibiotic resistance in agriculture. But any site is not just going to be about me: We've become a community here over the past few years. So please tell me in the comments or by email: What would be most useful to you? Let me know what your wish-list is for SUPERBUG, and I'll take it to the designers when we plan the new site.